Ageratum choices recommended by Nancy Szerlag in her Annuals For Michigan by Lone Pine Press. A. houstonianum forms a large, leggy mound that can grow up to 24" tall. Clusters of fuzzy blue, white or pink flowers are held above the foliage. There are many cultivars available; most have been developed to maintain a low compact form that is more useful in the border. ‘Bavaria’ grows about 10" tall with blue and white bicolored flowers. ‘Blue Hawaii’ is a compact plant, 6–8" tall, with blue flowers. ‘Pinky Improved’ is a compact plant with subtle, dusky pink flowers. ‘Blue Horizon’ produces blue lavender blue flowers on 2 to 3 foot stems. Here are some seeds for three varieties you can try. Blue Danube Ageratum is a one of the highest quality Ageratum seeds available. The flowers have a rich violet blue color. The uniform flowers grow to about 7" tall and are good for the gardener looking for a professional grade flower. The High Tide ageratum is a beautiful hybrid ageratum with very dense flowers. The closely packed flower heads make it the perfect variety for landscaping. The flowers grow taller than most other varieties (up to 24" or more). Well branched and self cleaning for easy maintenance. 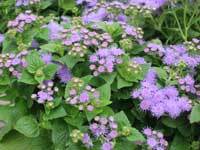 Hawaii Mix Ageratum is an early blooming variety of Ageratum with varying colors. The flowers grow from 6-8" tall and can grow into a variety of colors from deep blue to bright pink.